On July 4th, most people celebrate with barbecues and fireworks. Sometimes I go do those things too...but usually my mind is trying to pull out images of super-heroes with the American flag. 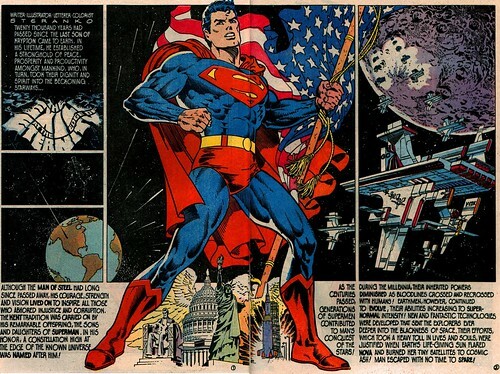 This image of Superman holding the flag is taken from Superman #400, a giant-sized anniversary issue featuring the biggest names in comics at that time. DC Comics managed to get Jim Steranko (an artist more associated with Marvel than DC) to write and draw a short Superman story, The Exile at the Edge of Eternity. The story was about Superman's legacy as mankind expanded throughout the universe. Sorry for the poor scan, but it's one of the most patriotic illustrations of Superman I've ever seen. Nuff said.